Quinoa and Corn Chips: Refreshing, and pretty too! Creating little bits of restaurant-style luxury at home can be really simple to do. It requires nothing more than a carefully drizzled sauce, a piece of bread stuck under the broiler until it's crispy and warm, or some fresh herbs stirred into a canned soup or mayonnaise. Recently I have been finding ways to spruce up the most basic thing in the world: water. I feel like I am constantly trying to drink more water, and constantly falling short. I know why I should be drinking it: it's one of the simplest and cheapest things we can do to provide a ton of benefits, including weight loss, increased energy, elimination of toxins, nice skin, etc. But knowing what to do and actually doing it are vastly different things. Part of my problem is that I get bored with plain old H2O, and another issue is that I simply forget. It sounds dumb, but unless I'm dying of thirst or there's a glass in front of my face, it doesn't always occur to me to drink. 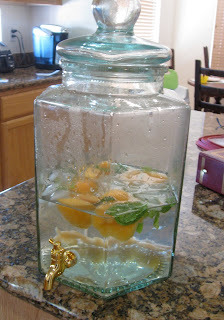 In that vein...I am super excited about my new little discovery: infused water. During a recent vacation to California, my husband and I stayed at a lovely Marriott in Marina del Rey. Every time we entered the lobby, we were met with a big glass water dispenser filled with infused water--a different flavor every day. It was ice cold, just a teeny bit sweet, and super refreshing. I kept finding myself going back to that water thingy again and again, suddenly excited about hydrating myself. It was partly because it was yummy and fancy, and partly because it was just there. You couldn't walk by it without pouring yourself some, and that--for me--seemed to be the key to the whole thing. So as soon as we returned to AZ, I went out and purchased myself one of those lovely glass water dispensers (mine was $19.99 at Home Goods, but they can be found just about anywhere that sells kitchen supplies). I filled it up with some filtered water, lemon slices and cucumber slices, and I was suddenly transported back to the Marriott...except that instead of boats gliding through the water, my view was of a living room filled with Barbies and puzzle pieces. The possibilities are endless! And you don't need much to give it flavor--just a handful of fruit and/or a few sprigs of herbs. 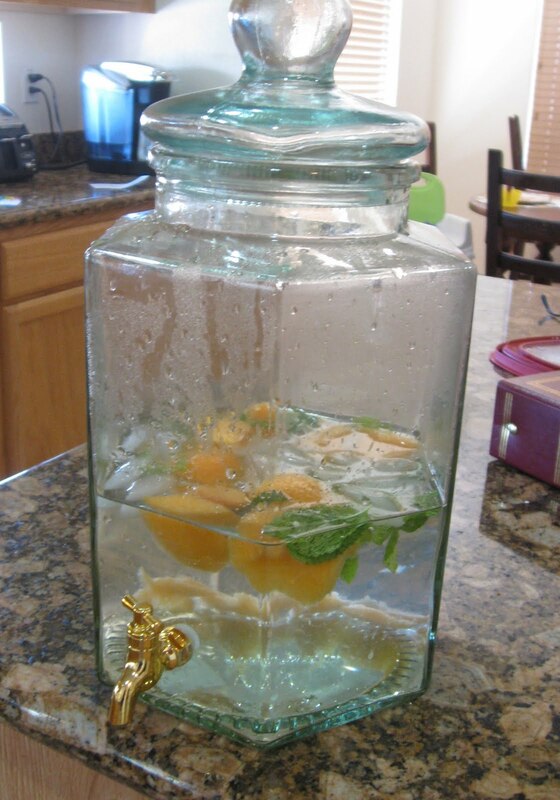 There's nothing wrong with just lemon either; it'll still look pretty on your counter and remind you to drink up. Cheers! I love it! Thanks for sharing!! !